Best 48+ channel analog for under $7k? Re: Best 48+ channel analog for under $7k? I see no benefit to putting the entire kit in a group, personally. Not for live anyway. I run a 16ch analog board(has 4 sub groups that can be used mono or paired in stereo) the only thing I've found useful to run through a group is the drums. I don't compress the drums as a whole but I find it useful to be able to adjust the volume of the entire kit; mainly I just use it to turn the drum mics on and off so I don't have to individually mute 6 channels. Even doing this I can still adjust each mic individually with their fader; if I had a VCA I'd probably use that instead of a group. I regularly put everything but overheads into a subgroup for parallel compression. I tend to compress the overheads a bit more to begin with but the other gives a nice fat sound on the whole kit. That subgroup then gets mixed in to taste depending on the feel of the song. VCA/DCA's are a different matter. The whole kit goes in one. My regulars are Leads, BgV, VoxFx, keys, gtrs, bass, drums and spoken word. Subgroups on leads, BgV, parallel drums and spoken word at a minimum. Patch a deesser and eq across the spoken word for feedback control and universal de-easing where you have limited processing. Use a sidechain filter on a normal comp with fast attack and release to make a de-esser if the desk doesn't include one (like the gld80 I was on this weekend). I think I'd prefer if you come listen to a mix of mine, rather than claiming I'm doing something of "no benefit" from afar. There is nothing facially unreasonable about a full drum bus. You can apply broad EQ strokes to the bus, control the entire drum volume with 1 fader, take a db or two off the top with a comp to glue the drums together, or apply a multiband compressor to address buildup of certain frees over multiple mics. I feel weird defending this practice that I've seen plenty of professionals do. I hope you don't interrupt your BEs to inform them there is "no benefit" to their mix strategies. You're misunderstanding me. I see no benefit to me. Huuuuuuge difference. I'm sure what you do works for you otherwise you wouldn't be doing it, right? I understand the logic behind processing the kit as a whole, but I personally prefer not to do that. At least for live. 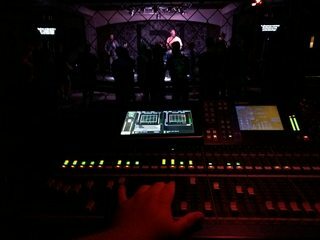 WIth our new digital console I dont use subgroups anymore except to feed the personal monitor system and the recording broadcast. We do use DCA's all the time now and I love them after not having any VCA/DCA on our previous console.